Background: Obesity is one of the major health problems with inherent risk of type 2 diabetes, hypertension, CVDs, etc. Adipogenesis is a major contributor in the process of obesity. Inhibition of adipocytes differentiation is one of the key approaches to treat obesity. Objective: To discover the new inhibitors of adipogenesis as the treatment for obesity. Method: We describe here, the synthesis, and anti-adipogenic activity of thiourea derivatives 1-14. These derivatives were synthesized by the reactions of phenyl and pentafluorophenyl isothiocyanate with different aromatic amines. Pure compounds 1-14 were evaluated for their in vitro antiadipogenesis activity employing 3T3-L1 cells lines. Results: Compounds 1-3, 5-9, and 11-14 significantly inhibited the pre-adipocyte differentiation into adipocytes, which was measured by staining the cells, and through morphological examination. Compound 10 (1-(4"-Chlorophenyl)-3-(pentafluorophenyl)-thiourea) showed a potent inhibition of adipocyte differentiation with IC50 = 740.00 ± 2.36 nM, which was more potent than the standards, epigallocatechin gallate (IC50 = 16.73 ± 1.34 μM), and curcumin (IC50 = 18.62 ± 0.74 μM). All other compounds showed a moderate to weak anti-adipogenesis activity. Compounds 1- 14 were also evaluated for their cytotoxicity. 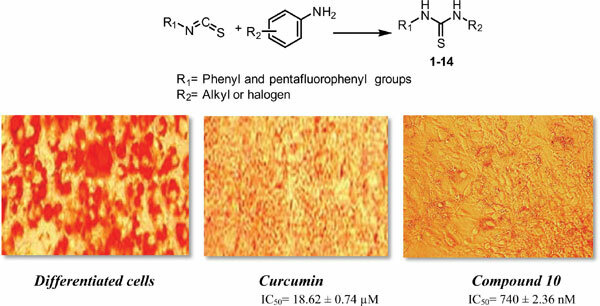 Compounds 3, 10, and 14 showed some toxicity to the cancer cell lines, while compounds 2, 3, 10, 12, and 14 showed a moderate to weak cytotoxicity against the normal cell lines. Conclusion: All the compounds reported in this paper are known, except compound 11. They have been identified as new inhibitors of Adipogenesis. Adipogenesis is the process of adipocytes differentiation from pre-adipocytes. This extensively studied model of cell diff differentiation. Further synthetic modifications, and optimization of anti-adipogenic activity may lead to the development of anti-obesity agents. Adipogenesis, thiourea derivatives, obesity, cytotoxicity, anti-cancer, hypertension, type 2 diabetes.